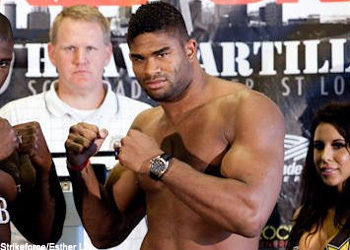 It didn’t take Alistair Overeem long to legitimize his post as Strikeforce heavyweight champion. The talented striker easily disposed of Brett Rogers at “Heavy Artillery” on Saturday night. Fans of Strikeforce waited 30 grueling months to see the Dutchman finally defend the title he earned against Paul Buentello, however it only took a mere 3 minutes 40 seconds to prove that Rogers didn’t belong in the same cage. According to the Compustrike stats that were tallied after the bout, Rogers landed only one of 14 total punches before being stopped via TKO. Things looked grim for Rogers from the outset, as the Chicago native appeared tentative and on his heels as soon as the opening bell rang. When they finally got into the clinch, Overeem literally tossed Rogers down like a ragdoll and took advantage of his challenger’s inexperience on the ground. “I was in the best shape of my life and I think this fight proved it. I wanted to finish him, like I always do in all my fights. I am happy, I proved myself right here,” Overeem stated following the win. After numerous unanswered strikes from the top position, referee “Big” John McCarthy stepped-in to prevent Rogers from taking anymore damage while in the fetal position. “It’s been awhile, but I am back. I’m the champion of Strikeforce and I ain’t going nowhere. I am here to stay,” the defending champion proclaimed. Now it seems all but certain that a bout with arguably the world’s best heavyweight, Fedor Emelianenko, looms in Overeem’s future. That is assuming the Russian survives his June 26th contest against Fabricio Werdum, of course.